In the early ‘60s, most surf bands were big California concert acts. But the Astronauts caught the sun, sand and summer fun from Boulder, Colorado—a remarkable feat in that they were 1,000 miles away from the nearest ocean. The Astronauts originally formed in 1960 as a trio, the Stormtroupers (named after bassist Stormy Patterson). But concern over the name’s fascist connotations from Boulder’s Jewish community necessitated a change. The guys opted for the Astronauts in honor of Boulderite Scott Carpenter, one of NASA’s first spacemen. 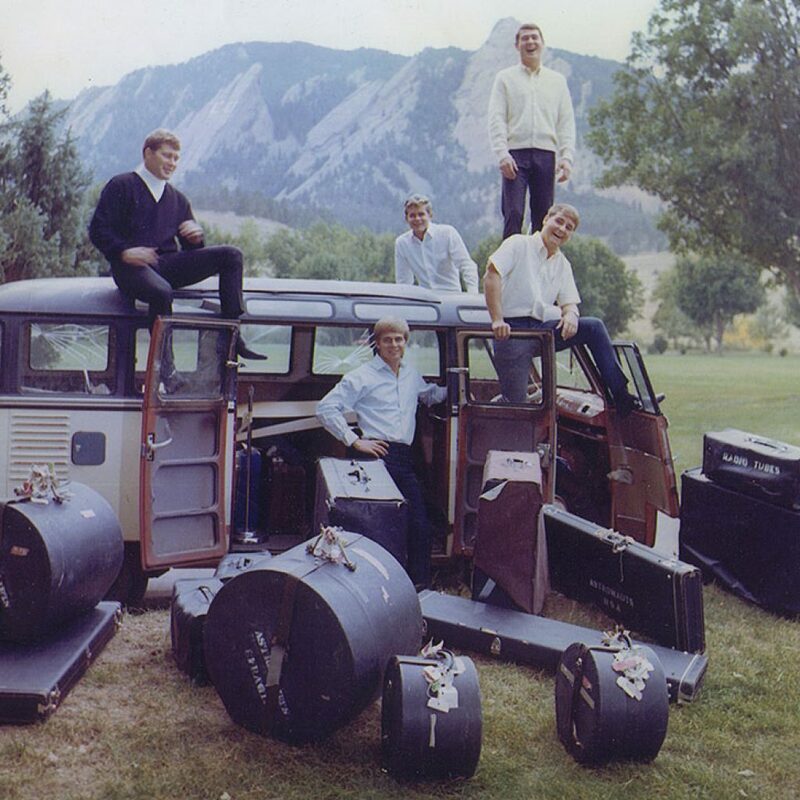 The classic Astronauts lineup—Rich Fifield (the only member who hadn’t graduated from Boulder High), Dennis Lindsey and Bob Demmon on guitars, Jon Storm Patterson on bass and drummer Jim Gallagher—played rock ‘n’ roll and R&B hits of the day to pre-hippie crowds around the University of Colorado campus circa 1962. At the time, RCA Records was looking for an act to compete with Capitol Records’ enormously successful Beach Boys, a West Coast surfing group scoring big on the national charts with songs like “Surfin’ Safari.” Even though they had never played surf music (or even surfed, for that matter), the landlocked Astronauts wound up with a long-term recording contract. Amazingly enough, the ruse actually worked for a while. “It was the strangest marketing scheme I’d ever heard of, and I’ve heard of a lot,” Gallagher confessed. The Astronauts were the first Boulder band to make Billboard’s national charts—Surfin’ with the Astronauts rose to a respectable #61. The album included “Baja,” penned by Lee Hazlewood (better known as the writer of Nancy Sinatra’s big hits). The single—a typical surf instrumental with a reverberation-heavy twangy guitar and driving drum beat—occupied No. 94 on Billboard’s Hot 100 for one week in the summer of 1963. On Denver radio, however, “Baja” reached No. 1 and earned the Astronauts a much bigger regional following. The group returned to their frat rock roots for two live albums, one recorded at their own Club Baja in Denver. The other, 1964’s Astronauts Orbit Kampus, was recorded at Boulder’s famous Tulagi and featured a cover shot with a snowy Boulder in the background. A local group of Astronauts devotees formed a fan club and petitioned to get the group on The Ed Sullivan Show to no avail. But the band appeared on television’s Hullabaloo several times and also had cameo roles in the teen movies Wild on the Beach (also featuring Sonny & Cher), Wild Wild Winter, Out of Sight and Surf Party. 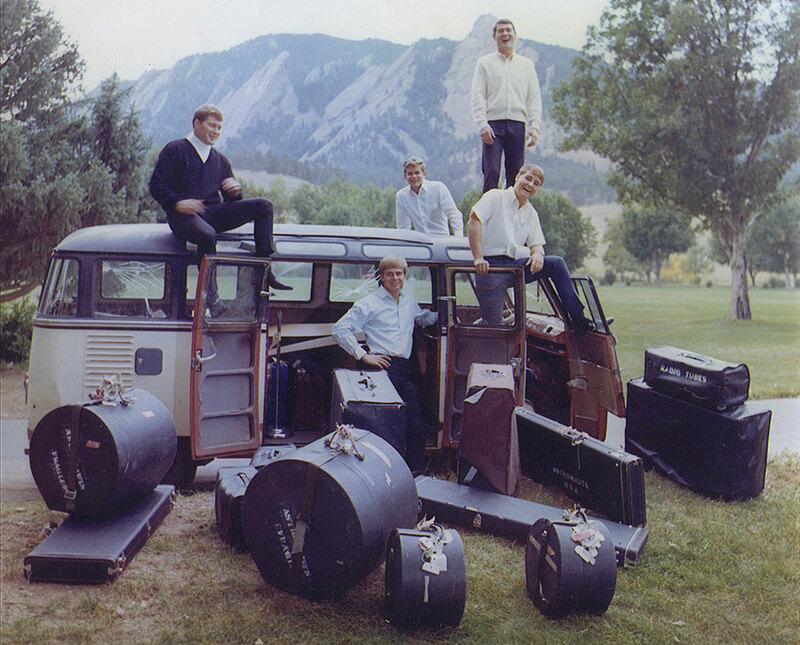 Like hundreds of other bands around the country, the Astronauts achieved a sort of working success, constantly touring a mind-numbing blur of colleges, gyms and bars. Ironically, the Astronauts enjoyed their greatest success overseas—in 1964, RCA discovered that the Japanese were mad for the band. They outsold the rival Beach Boys, and five albums and three singles made the Japanese Top 10. “Movin’,” titled “Over the Sun” for the Japanese market, hit No. 1. Five 50-foot billboard statues in their likeness were hoisted in Sapporo. “When we went to Japan for two tours, it was earth-shattering,” Gallagher said. “We’d played the Midwest and done pretty well, but nothing spectacular. Surfin’ with the Astronauts came out here in 1963, but it didn’t break in Japan until later. We had no idea how popular we were over there, or why. Then when we arrived at the Tokyo airport, 8,000 screaming kids were there. We kept wondering who they were waiting for. Then we found out it was us. Unfortunately, the Astronauts’ conquest of the Rockies and Asia meant little to the rest of America, where the group could never build on the initial chart success. Subsequent albums like Competition Coupe found the Astronauts trying on other styles like hot-rod songs. What really doomed them as a recording act was the 1964 British Invasion. The Astronauts continued touring through 1966, but immediately after recording their final album (1967’s Travelin’ Men), the draft struck. Gallagher and Lindsey both wound up serving in Vietnam. The Astronauts were essentially done until a triumphant 1989 reunion at the Boulder Theater, which would prove to be their last with the passing of Lindsey in 1991 and Demmon in 2010.